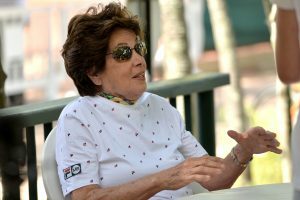 Maria Esther Bueno has been in Rio de Janeiro all week, working the Rio Open at the beautiful Jockey Club in temperatures that, at times, have reached well over 40 degrees centigrade. “The conditions here have made it hard for visiting players to play really well and we have had some unusual results over the week,” she told her website. Commentating for TV Globo’s SporTV throughout the week, Maria Esther has enjoyed getting back to work with the team of Eusebio Resende, Bruno Souza and Claudio Uchoa, alongside commentators Narck Rodrigues and Domingos Venâncio. “They are a great crew and I think we work really well together,” Maria Esther said as she kept a close eye on the form. 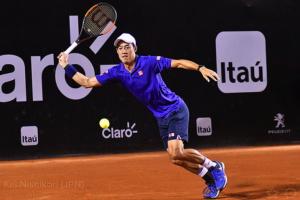 “It is always disappointing when the top seed goes out early on, but it was an exciting result for Brazilians when Thomaz [Bellucci] beat [Kei] Nishikori in the opening round! 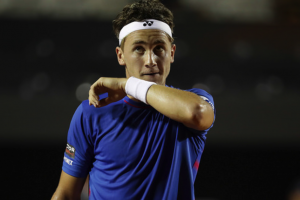 “Kei got to the final in Buenos Aires and lost in straight sets to [Alexandr] Dolgopolov so was probably a little tired. “He admitted he probably played the worst match of his life after he lost in straight sets but all credit to Thomaz for pulling it off. It wasn’t the greatest draw for either of them. 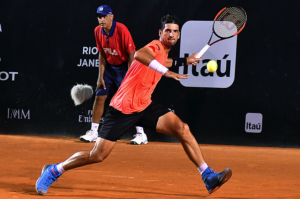 “It set up an all-Brazilian battle between Bellucci and Thiago Monteiro that packed out the stadium for a very tight match. 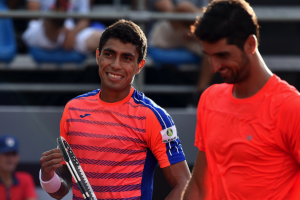 In the end it was Thiago who came through in three sets. 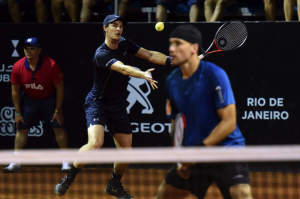 Eighteen-year-old Ruud arrived in Brazil as one of the Rio Open presented by Claro wild cards, seeking his first ATP-level tournament win and performing beyond expectations by reaching the semi-finals. The Norwegian showed solid form throughout the match and did not give any chances to Monteiro, frustrating the crowd’s hopes to see a Brazilian in the singles semi-final for the first time in the history of the singles draw with a 6-2 7-6(2) win. Ruud faced the Spaniard Pablo Carreno Busta, the No 4 seed in the draw and currently World No 24 in the ATP Rankings. Carreno Busta advanced to his semi-final place when Dolgopolov retired due to injury with the Spaniard leading 7-6(4) 6-7(2) 1-0. “The other semi was between Albert Ramos Viñolas and Dominic Thiem, the second seed,” continued Maria Esther. Thiem defeated Albert Ramos-Vinolas 6-1 6-4 on Saturday to advance, and Carreno Busta ruined the night of 18-year-old Norwegian Casper Ruud, 2-6 7-5 6-0. Ruud was trying to become the youngest to reach an ATP singles final since Nishikori nine years ago. He had a match point leading 5-4 in the second set but after he failed to convert, it all slipped away. “I didn’t play too well in the last set,” said Ruud, whose father Christian was a top-50 player. Thiem, who is 23, was seeking an eighth ATP singles title, five of which have come on his favoured clay surface. “Now I’m feeling really good again about my game,” Thiem said after playing hard-court events. Carreno Busta was after his third ATP singles title and was also in the doubles final afterward with partner Pablo Cuevas of Uruguay, which he won. “We saw two of the most attractive young players in the game on the court today,” said Maria Esther. “And Carreno Busto is finding really good form as he works his way up the rankings. It should be a great final. 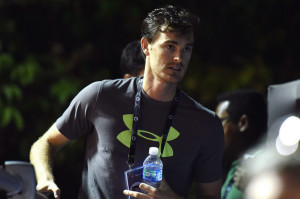 “It was great to see Jamie Murray, too, win his 300th doubles match on the ATP Tour here in Rio. Maria Esther has been busy with personal appearances too, starring in a unique presentation to a group of former top 100 Brazilian female tennis players, who were honoured on court on Monday night. The 19-Grand Slam title winner handed plaques to Gisele Miro (former World Number 99), Andrea Vieira (76), Patricia Medrado (48) and Teliana Pereira (43), while mention was made of Niege Dias (31) and Claudia Monteiro (72) who could not get to Rio de Janeiro. “These women have all given their best to women’s tennis and to tennis in Brazil,” said Maria Esther. “We come from a journey of overcoming obstacles to leave our names on the Brazilian female tennis history”, added Medrado. 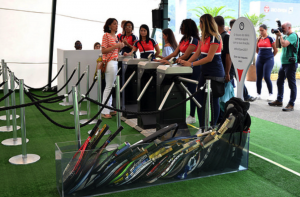 Before the ceremony, the players hit a few balls with the public and helped to collect used tennis rackets that will be donated to social projects supported by the Rio Open, including the Instituto Futuro Bom, Tênis na Lagoa, Tênis Solidário, Escolinha de Tênis Fabiano de Paula and Arremessar para o Futuro. 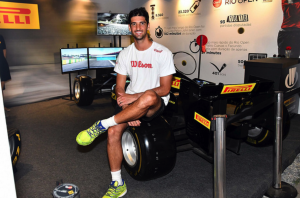 Maria Esther has also been been visiting with the directors of Pirelli and Fila and entertaining their guests at the Rio Open. She has also spent some time with Rolex and some of their guests. On Saturday Maria Esther helped out with the Clinic in which around 200 kids tried their hands at the game. 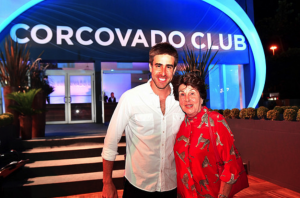 She began the week by attending the official player party held at the Corcovado Club in the grounds. 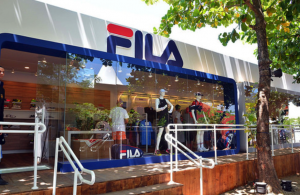 The Rio Open presented by Claro is the first ATP World Tour 500 tournament in Brazilian history and was the first WTA tournament held in Rio de Janeiro. It is part of a selected group of thirteen tournaments named ATP 500, and one of the 22 biggest events in the ATP calendar. 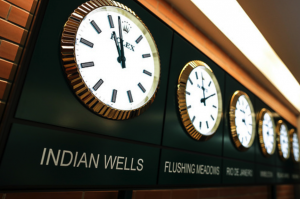 It is also the most important annual sporting event in the city, and one of the few ATP 500 tournaments played on clay, along with Barcelona and Hamburg. “Unfortunately, the women’s event didn’t happen this year, which I think is a bit of a pity,” commented Maria Esther. “I understand it was part of a strategic move by IMM, the organisers, who want to make the tournament even bigger and more comfortable for both the players and the audience. “Things have been going really well for the men’s event, with good attendances and a great atmosphere. 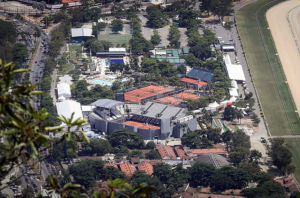 “It is a great facility, with 9 clay courts, including the show court that seats 6,200 people. 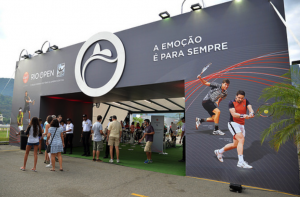 The Rio Open is the biggest tournament in South America and, in 2016, 45,000 spectators came through the gates at the Jockey Club Brasileiro, where they watched 92 matches contested by 94 players from 31 countries. This year it coincided with the world famous Rio Carnival. “That has its logistical problems too because the city is full but it adds to the atmosphere,” concludes Maria Esther.